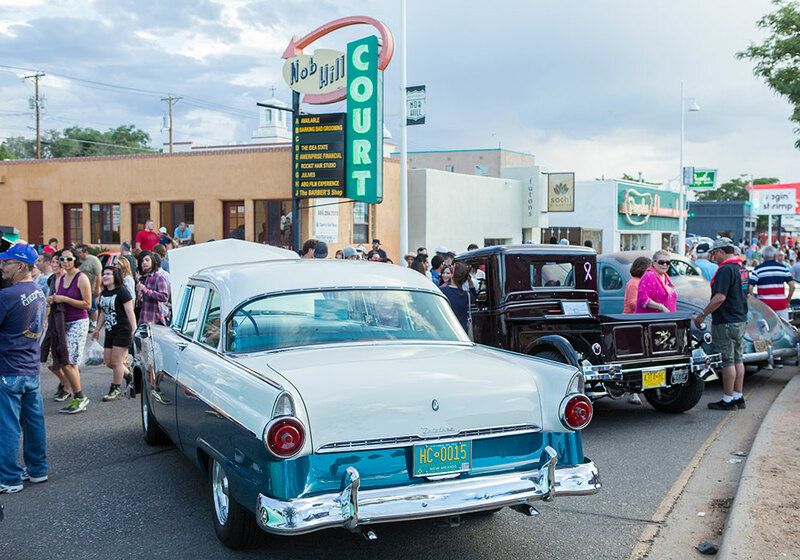 Nob Hill in Albuquerque sprung up around the golden age of road trips and cruising inspired by Route 66, which now serves as its Central Avenue. The community has played a central role in much of the preservation and bustling culture the neighborhood knows today. Progressive city planning efforts — past and present — are also creating an even greater Nob Hill. A classic car show in Summer 2015 along Central Avenue in Nob Hill. Photo by Eric Williams, City of Albuquerque. Nob Hill is bound by Lomas Boulevard to the north, Girard Boulevard to the west, Washington Street to the east, and Coal Avenue to the south. A look down Central Avenue in Nob Hill during a street party. Photo courtesy the City of Albuquerque. Get your kicks ... in Nob Hill. This quirky Southwestern neighborhood revolves around the culture of old Route 66, now known as Central Avenue for its position as the main artery and “Premium Transit Corridor” of the neighborhood. The busy stretch of street is filled with local shops, restaurants, and businesses, decked out in unique southwestern style buildings and neon signs that harken back to the 1950s and the height of Route 66. Community leaders and local groups have been fundamental to the neighborhood’s revitalization and exciting cultural scene. Residents and local businesses have pushed for planning efforts to strengthen the neighborhood. These community grassroots efforts resulted in the creation of Nob Hill Main Street Inc., a neighborhood-based revitalization organization. Today, the group continues to work to preserve historic buildings, some of which are known for their Southwestern pueblo/mission design. It also strives to make the street more pedestrian friendly and welcoming for residents and visitors alike. The planning successes of Nob Hill extend beyond its commitment to preservation. 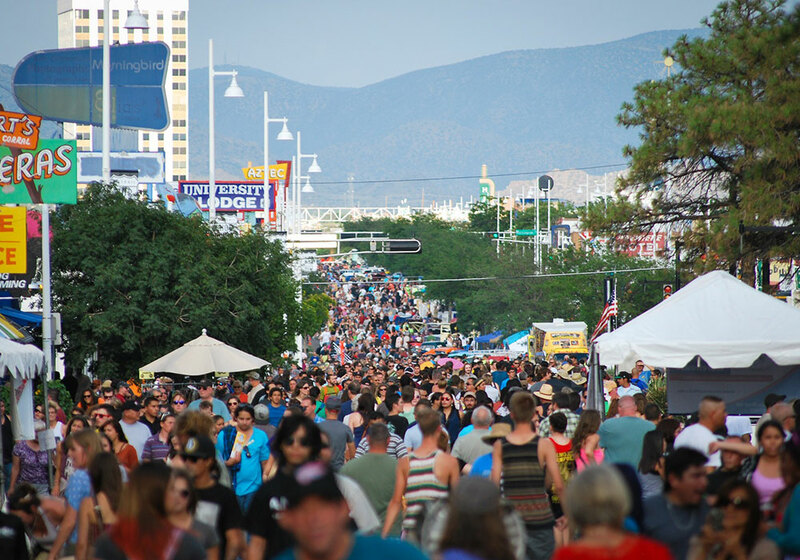 Nob Hill is the backdrop for two City of Albuquerque forward-looking visions — construction of a rapid transit route along Central Avenue, along with an update to the city’s comprehensive plan, and simplifying zoning in Albuquerque by implementing an Integrated Development Ordinance. The Albuquerque Rapid Transit project, better known as ART, is expected to create jobs, spur growth, and encourage the development of better pedestrian infrastructure like other rapid transit projects of its kind. ART will be the first rapid transit project in country to use electric buses — a move that will not only create a cleaner and quieter Nob Hill, but also protect the character of the community from fossil fuels. The Federal Transit Administration recently approved the start of construction for the ART project in Nob Hill. The Twinkle Light Parade cruising down Central Avenue in Nob Hill. Photo courtesy the City of Albuquerque. Nob Hill remains diverse and affordable. Rental prices have been stable over the past 10 years, and the neighborhood has maintained its percentage of Hispanic/Latino residents at 26 percent. There are significant plans to continue improvements and efforts to revitalize the portion of Nob Hill east of Carlisle. Transit routes run on all sides of the neighborhood and up and down Central Avenue. Bike lanes are also a feature of the neighborhood. Nob Hill has strong pedestrian connections to local businesses via sidewalks and paths. Solid pedestrian infrastructure is due in part to Albuquerque’s gridded street design. In conjunction with Anthea @ Nob Hill, the City of Albuquerque Planning Department’s Metropolitan Redevelopment Agency is redeveloping a vacant Route 66 motel site in Nob Hill into a new mixed-use facility. The De Anza Motor Lodge will offer boutique hotel space, retail, and restaurants while preserving precious Zuni Shalako murals and historic building facades that face Central Avenue. The project is slated to begin in early 2017. Route 66 Summerfest in Nob Hill celebrates 1950s culture through jazz music, swing dancing, and scrumptious barbecue. 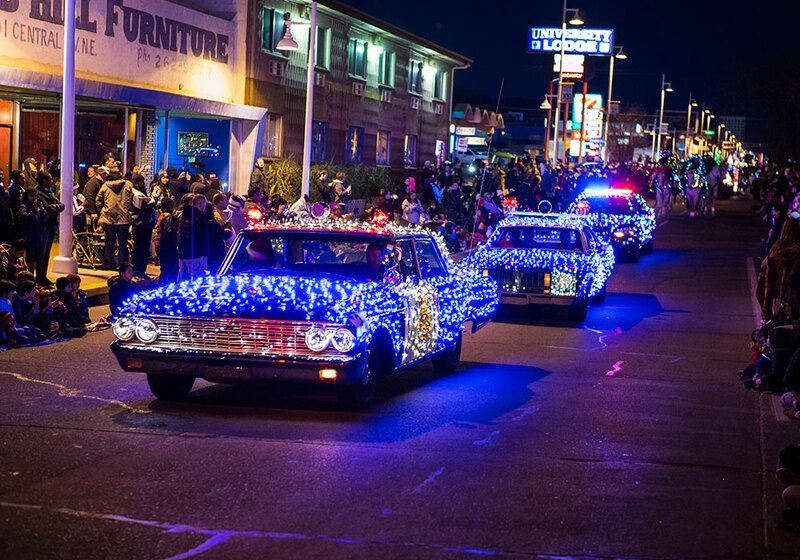 The Twinkle Light Parade, which goes through Nob Hill, is a family-friendly holiday event featuring dozens of floats, marching bands, equestrian clubs, fire trucks, car clubs, businesses, and Mr. and Mrs. Claus. The parade dazzles audiences with over 300,000 lights. Nob Hill celebrates its 100th anniversary in 2016, just in time for APA's New Mexico Chapter conference in Albuquerque.